Sponsorships > Another Shattered Dream? Savita’s family story is similar to that of Bishnu Khadga and Parvati Gole’s in that she also lost someone abroad! She used to be one of four in a family, but no more. She is one of the innocent and silent victims of a Nepalese migrant worker that died abroad. Her mother had travelled to Malaysia with big dreams of uplifting their family’s economic situation. Two years ago, after completing her initial contract and when her visa was about to run out, her mother had gotten in touch with the family saying that she would be returning home in less than two weeks. 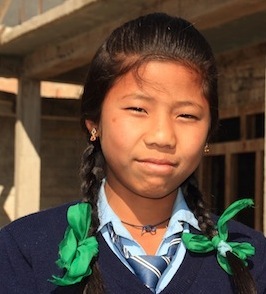 But within about a week, her brother and father had been told that she had “died.” Following her brother’s move to Kathmandu, Savita, who attends Shree Raithane Secondary School, lives with her only adult guardian, her father, a retired policeman. 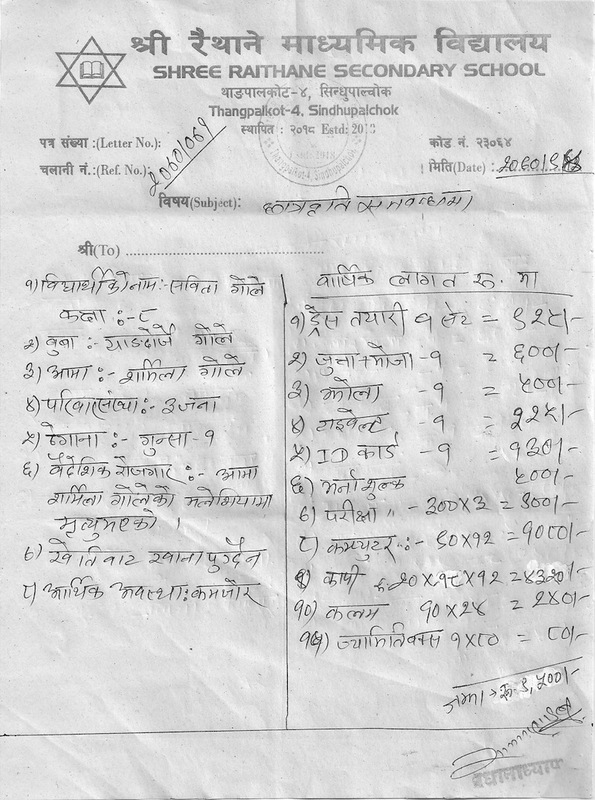 Attached below are details of her family and the costs of her education. At the current rate of exchange of approximately Rs. 98=US$1.00, the total cost amounts to US$97/year. However, she has just about three more months in 7th grade. (Academic year in Nepal runs from mid-April to the beginning of April the following year.) That means, she’ll need support for at least the next three years. If you are interested in sponsoring her, please first have a read of our sponsorship policy and follow the instructions therein. Please also inform me by email at dorje[at]dorjegurung[dot]com or dorje[dot]gurung[at]cminepal.org. Mrs. Schmidt has offered to sponsor education all the way through 10th grade. On behalf of Savita and her family, thank you! Savita passed her exams and is in grade 8. Savita has moved to India to live with her uncle. According to reports from the school, she is still attending school. As such we are ending our support for Savita.